This morning I received a beautiful gift from my special friend Vicki, she obviously knows me well. 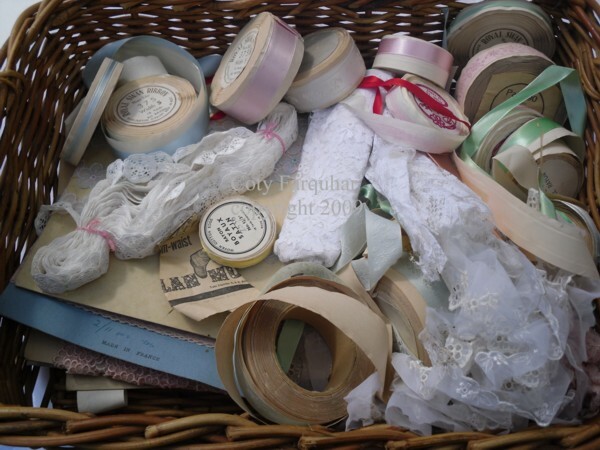 A very deep basket full of vintage ribbons, braids and laces still on the original roll and cards and made in France, Switzerland, England and Australia. 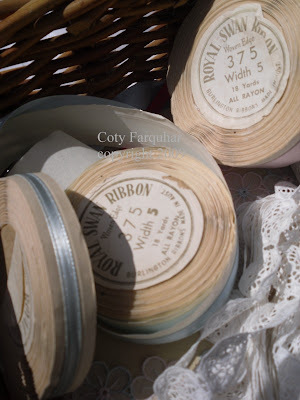 Someone's old collection..
My heart was filled with such joy, Vicki is so giving, she knew I would love them!. I let out a huge sigh when I looked into the basket. 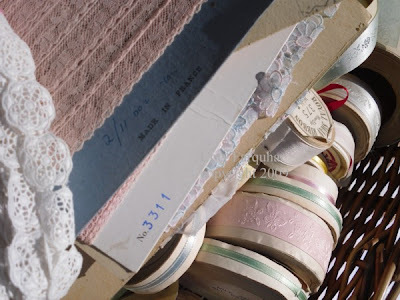 I'm a stylist, I'm a huge collector and to receive a basket full of ribbons, well, my little brain was and still is brimming full of ideas of what to do with them. I have a large collection of ribbons already, but that doesn't matter. I'm that girl that gets excited over tissue paper. 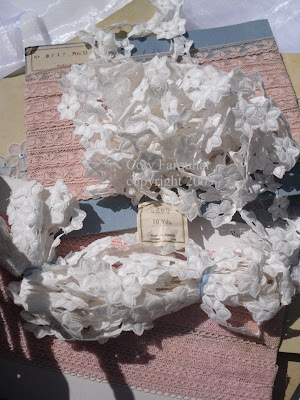 I'm the one that can't bare it when beautiful wrapping paper and boutique bags get thrown out after a birthday party or Christmas, I know, I know... a little mad in the head... is there anyone else out there like me.? I'm afraid I'm right there with you in the ribbon basket! After many years & raised eyebrows...I have my family trained. Holiday's & Celebrations? 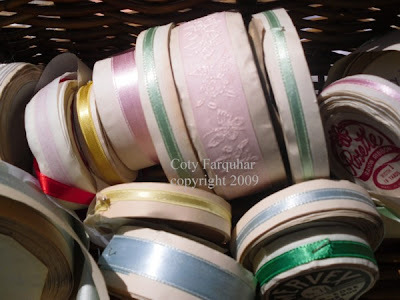 All ribbons go into mom's lap. Sande @ A Giftwrapped Life would understand also. I love seeing your spring photos & oh my gosh!!! The children's furniture is divine. I love that the desk has a scalloped or curved edge at the back to keep all crayons in check! Good to be with you again Coty, have a wonderful weekend. 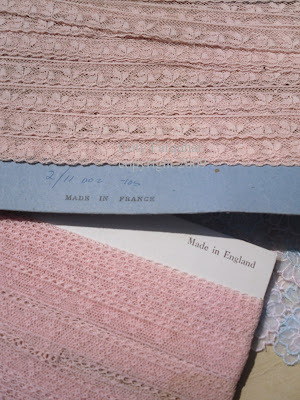 I am not a very envious person - but when I went to add lace to my daughter's dress I just purchased (that needed a mother's touch) alas! no lace or trim.......your images of your wonderful gift have made me envious! cheers to you this evening! p.s hope you are all well in your lovely part of the world.